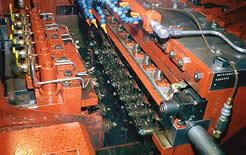 Technology: Cold Heading Services are metal forming services used to produce cold head parts such as screws, bolts, etc. It is a cold working process that imparts strength to components better than machining processes. Cold heading uses a combination of processes including cutting, extrusions, and upsetting, often with multiple strikes for complex parts. The process works with aluminum, brass, and a range of low and high carbon steels, along with a variety of exotic metals.